EDM RANKS - EDM is a $7B industry. But how did Electronic Dance Music get so popular? EDM is a $7B industry. But how did Electronic Dance Music get so popular? There’s no doubt that EDM (electronic dance music) is the fastest-growing music right now. With superstar Top 100 DJs like Calvin Harris, David Guetta, and Tiësto leading the pack, electronic dance music’s popularity has exploded in the past decade. From Electronic dance music festivals, to BPM radio, and collaborating with some of the worlds top DJs. EDM artists and DJs are getting a lot of attention lately, along with money; and fame. The EDM Rankings don’t lie, Forbes’ top 10 EDM artists have produced a combined $268 million this year, That’s 11% more than 2013, 66$ million of it was from Calvin Harris alone making him the richest top EDM musician for 2014. But before all this happened, Lets explain how EDM really started. How did electronic dance music grow from a small underground cult into a global worldwide phenomenon we see today? How have the original artists from the beginning grown with it? Where is Electronic dance music going next? To find out we will look at some of the biggest electronic dance music festivals in the world, TomorrowWorld, and getting news from the worlds top DJs like Tiësto and David Guetta. Electronic dance music (EDM) is not a new genre. It’s hard to pinpoint a date and location about the beginnings of EDM. Some say Germany, Some say London, others say EDM started in Chicago and Detroit, But it was really a global love for music across 3 continents that played a role in the rise of electronic dance music, North America, Europe, and Australia. But many will agree that the single place which really ignited the spark for EDM to begin and explode was with Germany’s electronic dance music Love Parade. Love parade first started in 1989 but really exploded in 2008 with 1.6 million people attending, It is still the largest parade to date. At the 2010 Love Parade all 1.4 million attendees were forced to walk thru a tunnel to reach the other side of the festival, It was only planned to handle 800,000 people. Due to a small tunnel that many people were forced to walk thru, For some unknown reason many panicked and a stampede started inside the tunnel. The accident killed 21 people and injured 500 others. At the 2010 Love Parade in Duisburg, the number of people attending allegedly reached 1.4 million – the original expectation was around 800,000 – whereas police believed around 400,000 people were present. 21 people were killed, and more than 500 injured, in an incident near an overcrowded tunnel leading into the festival. At least 20 casualties resulted from suffocation, caused by crowd pressure. Now Love parade no longer exists, and has since been replaced by many EDM festivals we all know of today. David Guetta, who began to DJ disco in 1980s Paris, Recalls how the electronic music movement began when the disco era was dying. It was a shame to like disco, but then there was no music to dance to, so some DJs started to use old disco records, but the B-sides and the A Capella’s, and we began producing beats with drum machines. What David means is, DJs injected disco music into people’s ears on the dance floor. I remember buying those records and the label (vinyl sticker),” says Guetta. “(DJs) would use old records and print on top of it, melt it, and print on the top…very low quality, this was super, super underground. Disco was the pre EDM music to EDM today. I started in ’88 to play House music, it was a huge revolution for me. I went to London and I saw a DJ on stage and that was crazy at the time. I was one of the really respected and famous DJs in Paris, but they would never show me. I was hidden. A DJ on stage and people dancing and facing the DJ, looking at him? I was like ‘wow! A few years later, in the early 90’s in a small town of Breda, Netherlands, Tijs Michiel Verwest (DJ Tiesto) began his journey to becoming Tiësto, A trip to Spain and some parties mixed with a general love for music got Tiesto interested in becoming a DJ. Tiësto, The worlds Top DJ, Known for bribing a fast paced four-to-the-floor ‘Trancey’ dance genre with high energetic bright sounds and groovy rhythms that was completely underground dance music to the masses. Electronic Dance music tracks are breaking records, and still rising. Avicii’s ‘Wake Me Up” was streamed over 294 million times on Spotify, It sold more than 8.5 million copies worldwide and spent over 1 year on billboards top 100 list. David Guetta has found mainstream success by collaborating with pop stars like Kelly Rowland, and The Black Eyed Peas, for whom he produced the single ‘I Gotta Feeling’ in 2009. Other famous DJ’s, including Calvin Harris and Avicii have also found success this way. Social media has also played essential roles in EDM blowing up. Today, in the digital era success is also measured in followers, video hits, downloads, hashtags, tweets, re tweets and likes. All we did for one year is talk to DJs by Facebook and somehow that got us our first gig. Social media has been the biggest factor in our career. Said 1/2 of the Dimitri Vegas and Like Mike duo, Dimitri Thivaios. In Europe and the Americas, mainly, there are an increasing number of electronic music festivals; events that gather people from all over the world and celebrate in unison. The TomorrowWorld festival celebrated outside of Atlanta, Georgia, gathered 160,000 people from 75 countries this year, according to the organizers. Electronic Dance Music Festivals are becoming the new trend for Millennial’s. Electronic Dance Music Festivals are becoming the new trend for millennial’s. In the summer of 2014, More than 400,000 EDM fans arrived from more than 50 countries across the globe to grather in the little Belgian town of ‘BOOM’ for Tomorrowland, The biggest electronic dance music festival in the world. Not all genres can brag about selling out festivals with over 150,000 attendees in a matter of minutes. Some will argue Bonnaroos and the Coachella’s festivals of the world, but those offer a wider range of musical variety, Such as pop, rock, indie and even some country. EDM was unlikely to become this popular if it couldn’t generate large amounts of money. A recent study showed that EDM is a $6.2 billion global industry. Very well close to the 7 billion dollar mark, Which EDM will surely pass that evaluational in 2015. Most of the money comes from the EDM festivals, Las Vegas clubs, and other global EDM gigs. Which has caught the eye of big brands like Sprite, Who sponsor Tiesto to DJ in a special EDM video promotion for the brand. 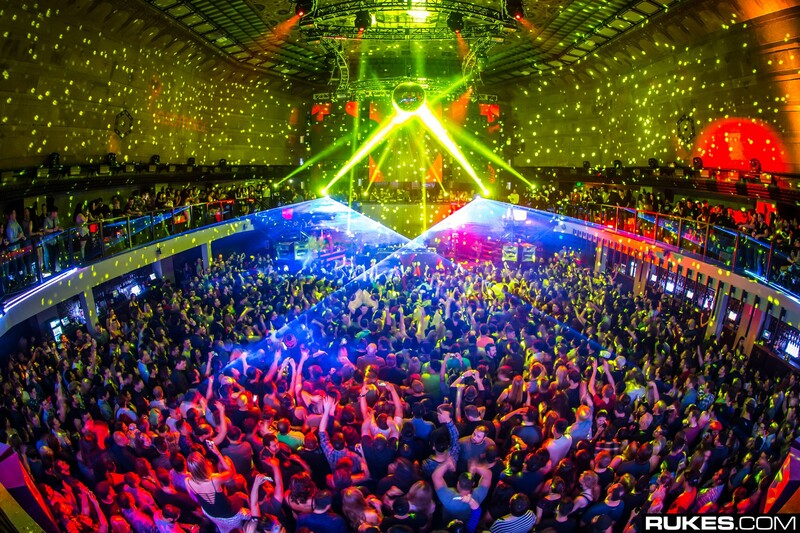 Live events represent the largest piece of the $6.2 billion dollar EDM industry. Booming business is great, But is EDM getting better? Many wonder if EDM is at his highest point. Is this its climax? Or will it end soon, just like Disco did? This entry was posted in Artists, DJ, EDM, EDM Clubs, EDM Festival, EDM News, Electronic Dance Music, Electronic Music, House, Music History, Music Technology, Producers, Top 100, Trance, Underground Artists/DJs, Videos and tagged #1. Bookmark the permalink.